Happy (almost) New Year's Eve everyone! Tonight I have for you a favorites post that is a little different than some you have been seeing around the blogosphere. These are my favorite polishes that I acquired this year that were released prior to this year - in other words, polishes I was behind on! I was going to narrow this down to 12 for 2012 but I just couldn't knock any of these off my list so I have lucky #13 for you today. Here they are in no particular order. Chanel Dragon - I received this as a birthday gift in November. It was my first Chanel and it is simply amazing. Perfect. Red. Creme. China Glaze High Def - this is from China Glaze's Tronica Collection that came out in 2011 - and I managed to miss every single one. Now I need them all. LOL! This one is a perfect dusty blue. Dior Liquorice - this super hard-to-find Dior is simply amazing. The picture speaks for itself. Illamasqua Hectic - I do love me some poopy greens and this one is my favorite. It was not easy to acquire this polish as it is extremely hard-to-find so that makes me treasure it even more. MAC Bad Fairy - this one needs no explanation. And the story behind it makes it very near and dear to my heart. Zoya Petra - this is one of my go-to polishes. I wear this polish a lot and am at least halfway through the bottle. Dior Purple Mix - one of my favorite polishes out of my whole stash. 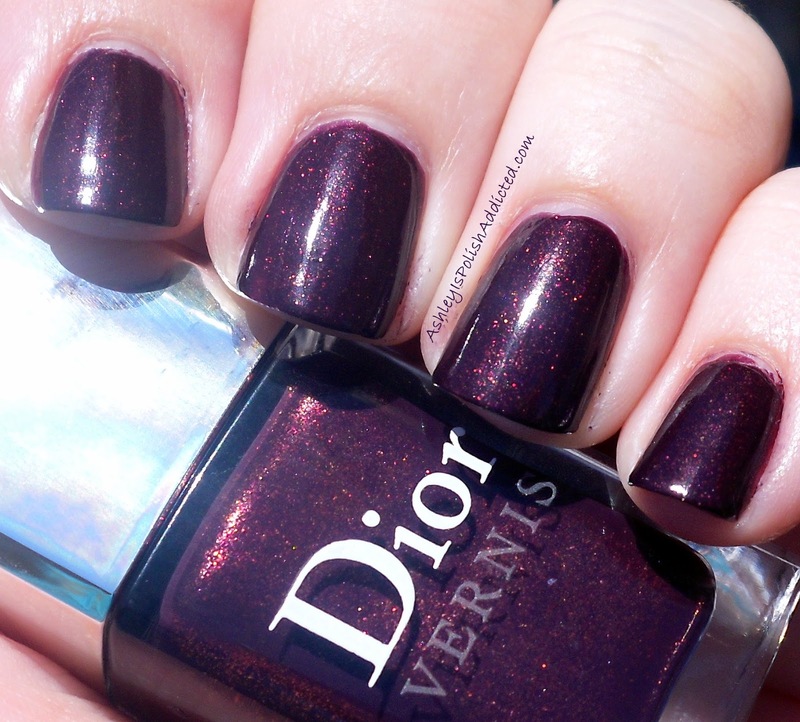 You can't go wrong with a Dior creme and this color is to die for. China Glaze Hyper Haute - another offering from the Tronica Collection. This is my favorite out of the Tronicas that I have so far. Zoya Jana - I wear this polish all. the. time. 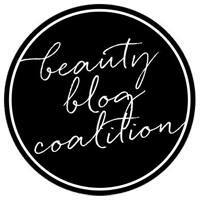 However, I realized I have NEVER blogged it! How in the world did that happen? LOL! So, I have borrowed a photo from Pointless Cafe. Dior Jamaican Pepper - can you tell that I love Dior? This time last year I had never even considered Dior polish - now it is one of my favorites. I would own even more if my wallet would let me! Orly Frolic - just such a happy, cheery color. Orly Green Apple - this shade of green looks yummy enough to eat (pun intended). Sinful Colors Dream On - (shown with stamping) - I absolutely adore this color and the rubber finish of this polish. Well, there are my previously-released favorites! I will be back tomorrow with more favorites! Let me know your favorites in the comments! I hope you are all having a lovely weekend so far! 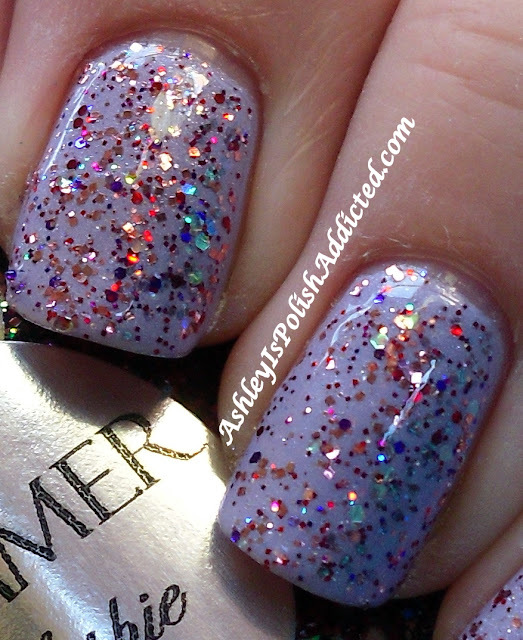 I have some blingy Shimmer Polish spam for you tonight! I have a lot of polishes to show you tonight, and a lot of pics to go with them. All of these had a very good formula - they spread nicely and evenly and laid flat on the nail. All of the glitters were suspended in the base with no sinking or settling. I used one coat of Gelous and one coat of Poshe on all of these to make them perfectly smooth. All were either in a clear base or a very SLIGHTLY tinted base so I have chosen to layer them over other colors. (You could wear all of these on their own in approximately. 3-4 coats.) Lets get to the pics, shall we?! 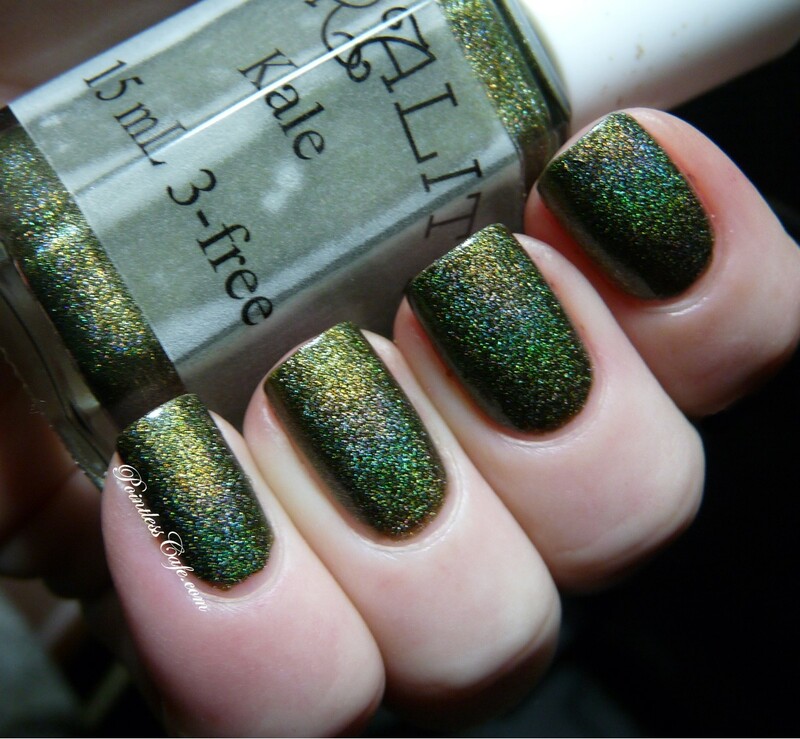 Kelly is a mix of various green and gold glitters. This is one coat over Zoya Neely. Sonia is a lovely mix of lavender, pink and gold glitters - such a pretty mix. I layered one coat over Misa Frozen in Time (a periwinkle with slight shimmer). Katherine is micro-fine bronze glitter that can be worn alone in 3 coats (as pictured on my pinky). The other nails show one coat over Nails Inc. Fulham Palace Road. 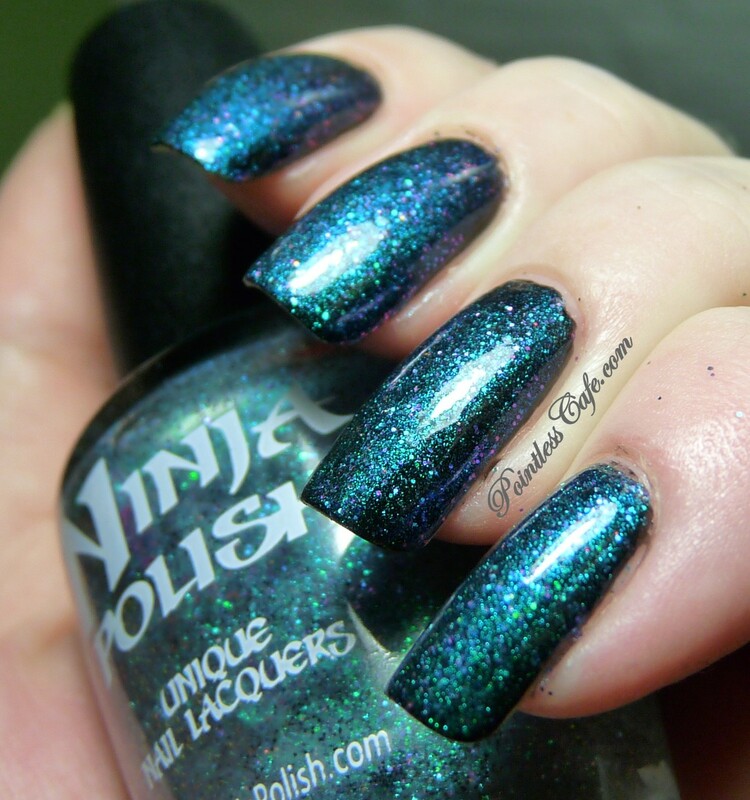 Linna is an emerald green and teal mix of glitters, with a few other colors thrown in there. One coat over Zoya Julie. 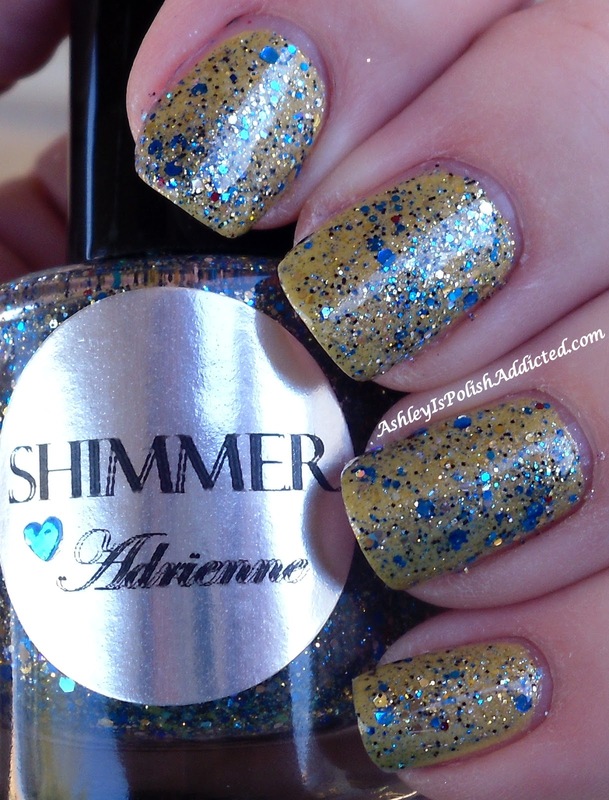 Adrienne is royal blue, gold and silver in a clear base. One coat shown over Zoya Piaf. Sophie is a mix of pink, red and gold glitters. This one is in a slightly tinted base so I have shown it with 3 coats alone in my pinky in the first 2 pics. The other 3 nails have one coat over Jade Diamond Royale. Carol is a mix of copper and blue in a clear base. This one is a little more sparse than the others so I have shown two coats on my index finger and one coat on all of the others over Zoya Jacqueline. Julia is a lovely ice blue mix with some silver thrown in. One coat over Zoya Blu. So what do you think of these? 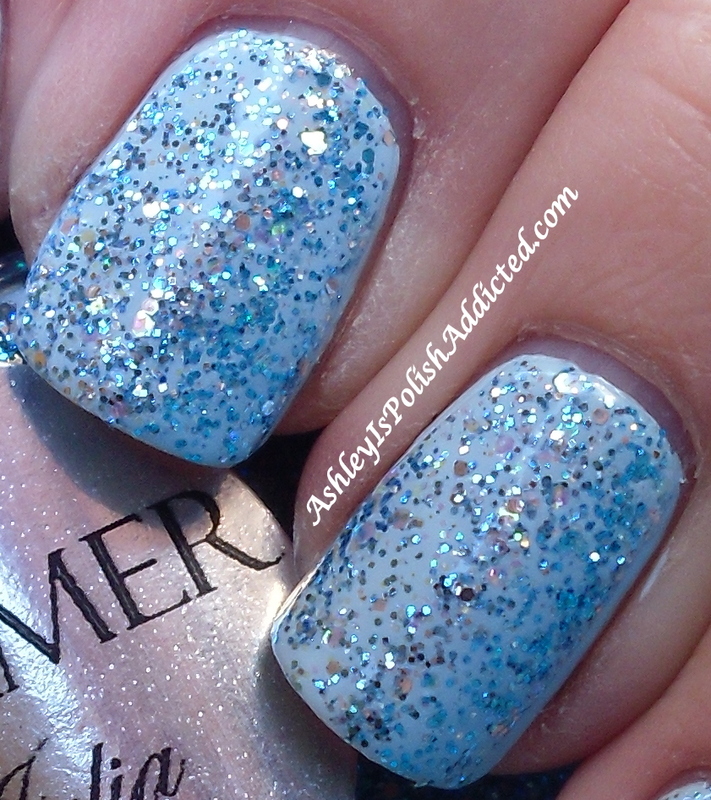 Shimmer Polishes are perfect if you like bling! They are very sparkly and that just can't be captured very well on camera.